Up to this point, domestic Suda 51 fans have largely been forced to rely on poor Google translations of Japanese coverage for news on his latest project, Killer is Dead. This is usually not much of an issue, however, Suda 51 games are notoriously (and brilliantly) difficult to understand all on their own — doubly so when there is a language barrier. Fortunately, the Western marketing for the game is now starting to ramp up thanks to Grasshopper Manufacture’s North American publishing partner, XSEED Games, who has just re-released Killer is Dead‘s debut trailer with the English voice actors. For those of you who have not been keeping up with Suda 51’s latest, Killer is Dead takes place in the “not-so-distant future” on a world that is similar, but not exactly the same as our own. Players take control of a 35-year-old man named Mondo Zappa, who takes take a job with the Brian Execution Firm that has him traveling the world to kill a number of “cunningly evil” assassins. To execute his new job requirements Mondo has two different weapon types; a Japanese sword that he uses in his right hand, and an artificial left arm that can be used as an interchangeable weapons platform. While his sword is limited to close-quarter attacks, Mondo’s cybernetic arm can be outfitted with a gun, drill, or several other weapons that players find over the course of the game. Additionally, the mechanical arm has the ability to “collect” blood from fallen enemies that can be spent on “Adrenalin Burst” attacks, which are used to kill foes with a single blow. 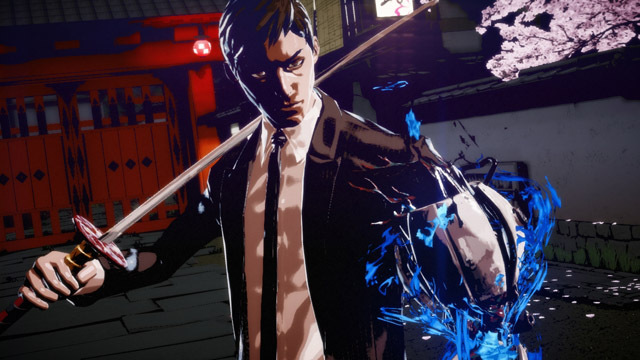 Killer is Dead is currently scheduled to launch worldwide sometime this Summer on the Xbox 360 and PlayStation 3. Check out the new English voiceover debut trailer below, which should give you a good idea as to what Suda 51 has in store for us in just a few short months.